Multi-Purpose Responsive WordPress & WooCommerce Theme with eCommerce User Experience and extensive functionality. also, Utilizes many advanced plugin (Visual Composer). It’s perfect & corporate layout for any kind of web shop, Personal Blogging, Portfolio website. Created a highly customizable and User/Developer friendly WordPress theme. SAVE YOU $34 – The WordPress theme includes the amazing WordPress Page layout builder – Visual Composer (save you $34). Bigshop comes with several useful shortcodes, widgets, custom post type to make your site to look professional. Easy Customization – We use custom admin panel, Visual Composer inlcluded – worth $34, shortcodes. The posibilities are limitless! Visual Composer is the first page builder that gives you full control over responsiveness. It has never been easier to create a responsive website and control how your layout (or even individual parts) behave on different devices. 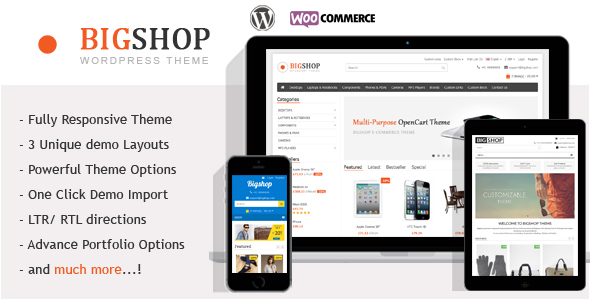 Bigshop theme was created to make it easy for users to have control over the design, layout of their site with no code required. All layouts can have left sidebar, right sidebar and fullwidth can manage from theme options. Advanced Grid System – set 3, 4, 5, or 6 products in a row. Advaced Grid System with manage columns. Advaced Grid System, set 1, 2, 3 or 4 portfolios in a row. Product and thumb image slideshow. Thank you for purchasing one of our products, We really appreciate it! To get the best support possible please visit our support system. Tweets and comments containing support question may be ignored, please use the support system. Previous post: MTStudio Responsive Bigcommerce Theme!